Darkest Hour tells the story of Winston Churchill’s rise to British Prime Minister and the month following his appointment. It was a time when it was difficult to find someone who would take on the position, because doing so meant dealing with Hitler and facing enormous criticism and backlash if unsuccessful. Churchill had warned the British government earlier about how dangerous the Nazis were. Throughout the movie, even as those around him want to negotiate peace with Hitler, Churchill believes that would be folly. At one point he says, “You cannot reason with a tiger when your head is in its mouth.” Rightly so. If he had allowed Britain to surrender to Germany, things would have turned out quite differently for the entire world. 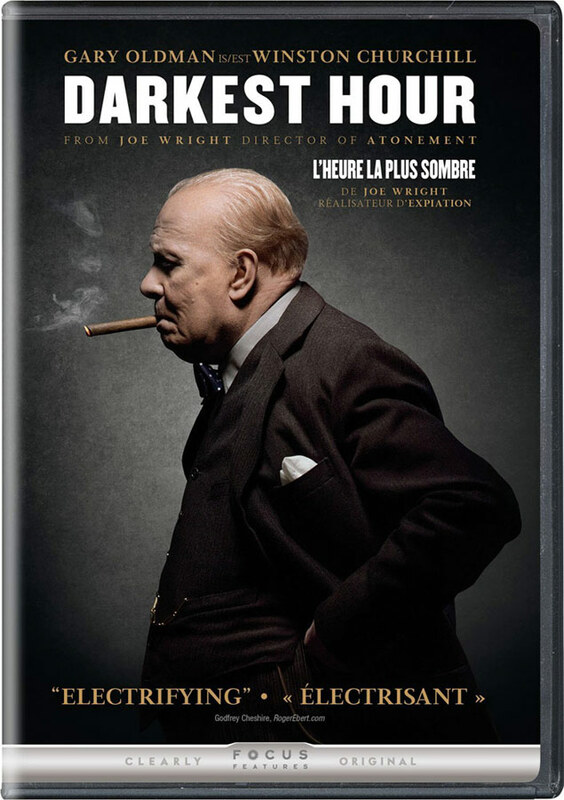 Darkest Hour is an interesting look inside Britain’s political system, and there’s no doubt there were a lot of politicians who were anti-Churchill even when the people loved him. But even though this is based on historical fact, it’s at times loosely interpreted. We get the basic facts, but there’s a subway scene with Churchill that is a flight of fantasy — though quite a nice, heartwarming scene — and several others that show Churchill as waffling and weak — he could even be described at times as a bit doddering, as portrayed by Gary Oldman in this film. If you watch film clips of Churchill at this time in history, we see a strong man filled with resolve. He had a toughness that was visible in his eyes, in the way he carried himself. There was a reason for his nickname, which was the “British Bulldog.” At the time of this movie, he was 66, but as he’s portrayed, he appears to be in his late 70s. That’s not to say that as Churchill, Gary Oldman doesn’t transform himself physically. He’s completely unrecognizable and even picked up some of Churchill’s mannerisms and nuances. However, the strength that you see in Churchill’s eyes in old newsreels is absent. I kept waiting to see the fire in his eyes. Churchill’s strength and resolve saved 300,000 at Dunkirk when, as we’re told in the film, the rest of the government decided the men — in fact the entire British army — was lost. Losing their entire army would have made Britain sitting ducks and would have had dire consequences for the entire world. Churchill decided to save the men, whatever it took. And he did. I have to admit Oldman, when given a speech such as the rousing and iconic “We shall fight on the beaches” speech shown in the film, finally shows Churchill’s strength and determination. Ben Mendelsohn turns in a powerful performance as King George VI — a.k.a. “Bertie.” Mendelsohn is often called on to play bad guys, such as his Emmy award-winning turn in Bloodline, but hopefully this movie proves his range to casting directors — he plays Bertie with class and distinction. Lily James, who plays Elizabeth Layton, Churchill’s personal secretary, stands out as well, giving her character a liveliness and intelligence that makes it easy to see why Churchill found her indispensable. Although, checking the dates, she worked for Churchill from 1941 to 1945, and this movie takes place in May 1940. In the film, we learn her brother died at Dunkirk, but in real life, Elizabeth’s brother didn’t die during the war. A small alteration of the facts, but still a reminder as to why we need to remember that historical movies are often also part fiction. Keeping that in mind, it’s a fascinating movie, offering up a very important time in the history of not just Britain, but of the world and a look at the man for whom many still feel deep gratitude. Into the Darkest Hour – this featurette shows us how the locations, costumes and cast were chosen. It talks about the claustrophic atomosphere of wartime London, which is accurately depicted in the movie, as windows were shuttered over and people spent time in basements due to bomb threats from planes flying overhead. Gary Oldman: Becoming Churchill – Oldman talks about what lengths he went to in order to physically transform into Churchill. t would like 2 senior tickets to see the show about 2 pm on Thursday Mar.1/2018 in the upper level…not in a lower level seat close to the sreen.